One the of things to take into consideration for this review is that the Crew at RoosterTeeth are continuing on without RWBY Creator Monty Oum who sadly passed away on February 2015 and in place of him voicing the character Ren is his Brother, Neath Oum. Picking up where Volume 2 left off, Yang meets her presumed long lost Mother, Raven Branwen, who rescued her during her fight with Neopolitan, Beacon Academy and the town of Vytal recover from an Extremist attack by the “White Fang” who were supplied with stolen weapons & mechs by Torchwick. The White Fang used an abandoned underground transport from an evacuated city from long ago that’s overrun with Grimm which followed like the curious animals they were and caused Havok. 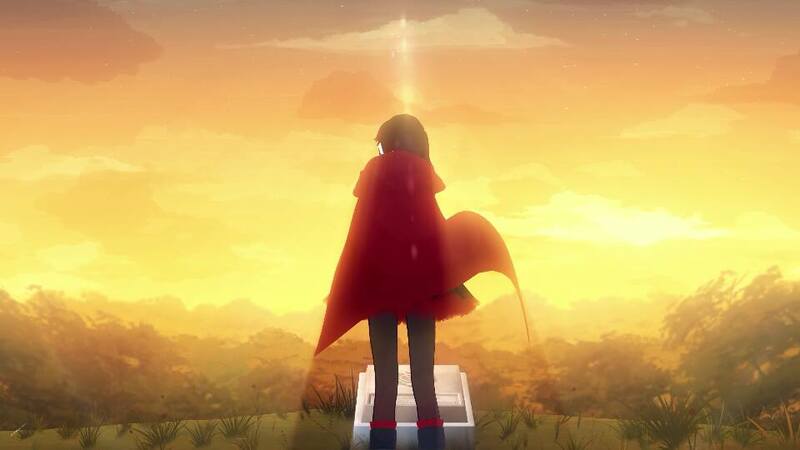 It begins quietly atop a cliff in autumn at the Grave of Ruby’s Birth mother Summer Rose and Ruby telling her mother everything that’s been new with Herself, Yang and their father. Strangely Ruby’s dad in the background looks like a cardboard cut-out of himself while their dog Zwei is animated just fine but overall It’s a touching scene and properly convey’s what it needs to do before we get to the main plot cutting to the Coliseum. We cut to a floating Coliseum that has a Half-Ice and Half-Volcanic flooring in the sky far from the School where the tournament takes place and we see the two beacon teachers Dr. Oobleck and Professor Port as Commentators with the minor running joke that people keep mistakenly calling him “Professor” instead of “Doctor” which is a fun callback to Season 2. Oobleck and Port breakdown the basics of the tournament that it’s broken down to “Teams, Doubles and Singles” and those who lose in the team tournament will elect who will represent them in the “Doubles” Round followed by the losers of the Doubles round and the losers of their respective teams choosing 1 to fight in their behalf and the remaining combatants will then fight their way in a more traditional tournament bracket to compete for “Champion” status for their kingdom. In many ways It gives me flashbacks of watching “Harry Potter And the Goblet of Fire” for how surreal, colorful and otherworldly it is. Afterwards the scene cuts to the titular Team RWBY getting food which leads to some comedic banter while Weiss receives a phone call from her Father she quickly ignores while Emerald secretly pickpockets Ruby into a conversation giving her back her wallet while they talk about the Tournament that cuts to Cinder, Mercury Emerald and now Neapolitan in Disguise crushing a rival student with her foot. Seeing Neapolitan after last Season gives a strong sense of foreboding while cutting back to Emerald politely turning down eating with them while secretly collecting information about who they’ll be up against in the “Doubles” round and expressing to Mercury afterwards her absolute disgust towards Team RWBY and how she thinks Team RWBY is “Too-Happy”. Weiss’s credit card being declined which I think is foreshadowing to why Weiss’s father was trying to contact her earlier but their food was thankfully covered by Pyrrha which quickly cuts to the aftermath of their meal where Nora says everyone except Jaune has progressively improved their fighting skills and Nora comically & hyperactively laments about the possibility of failure (While in the process also revealing that Her and Ren are Orphans with no home to go back to.) which looks like what would happen if Pinkie-Pie went Emo in a hilarious way. Ren’s voice is not very noticeable which shows the effort of how eerily similar Neath’s voice is to Monty. We Cut to another Tournament Fight this time with Team JNPR (Pronounced Juniper.) entering the Tournament against a Rival School while showing Cinder, Mercury and Emerald in the Audience and further reminding us that Cinder has fire powers by showing her pop a popcorn kernel with just her fingertips while talking about their possible dominion over everyone. We learn that the Coliseum can randomly change the environments when the match calls for it and he Fights begins for JNPR and then it cuts to black for the New Opening. 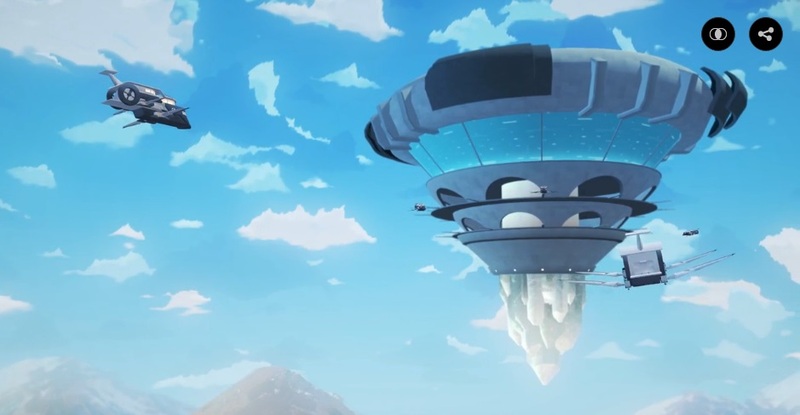 For the Opening of Season 3, The Intro sets the tone with an Intense new Song called “When It Falls,” by RWBY Music Regulars, Jeff Williams & Casey Lee Williams, with flashy, fluid Action & imagery accompanied by some foreshadowing with possible conflict & drama from multiple directions with the introduction of newer characters seamlessly in the mix of it.